"Try this one in the summer. If you like cherries, you will like this." Drain the canned cherries; place liquid in medium saucepan and set cherries aside. In a small mixing bowl, combine cornstarch and cold water; mix well. Whisk cornstarch into cherry liquid. Heat to boiling point and boil for 5 minutes, stirring constantly. Add sugar and lemon juice. Stir and remove from heat and chill. When this syrup is cool, blend in the sour cream and add the drained cherries. Chill well and serve in chilled cups. See how to make a custardy dessert with fresh cherries. I have a recipe that is similar to this one - it is a hungarian soup. In ours there is no lemon juice and less sugar and we bundle whole cloves in and let it simmer as the cherries cook. Yum! I would make this again, but watch out for too much lemon juice. Doubled the recipe, but found that 1/4 cup made the soup way too tart! Also added a cinnamon stick to the boiling mixture. great soup! I loved this with fresh tart cherries. Added a little white wine as well. 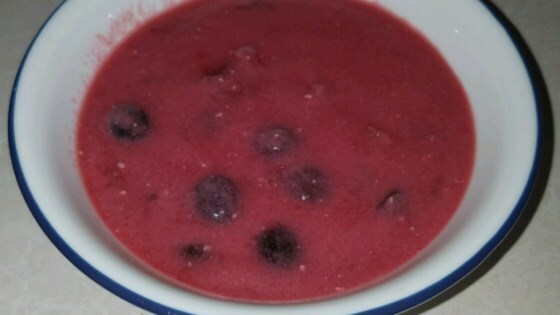 I love cold soups in the summer and this was terriffic! My guests loved it!